1. Cut the stem and bottom of the beets. Use a melon baller to remove core to make a cup. 2. Mix all other ingredients except the heavy cream and chives in a bowl. 3. Stuff the sausage mixture into each beet cup and pile more on the top. 4. Make small meat balls with the leftover sausage mixture. 5. Put the stuffed beets and sausage balls in a small sauce pan and pour chicken stock until it just covers the beets but not the sausage on the top. 6. Bring to a boil on medium heat then turn the heat to low and simmer with a cover for 50-60 minutes until the beets are tender. Pour the stock over the beets 2 or 3 times while they are cooking. 7. 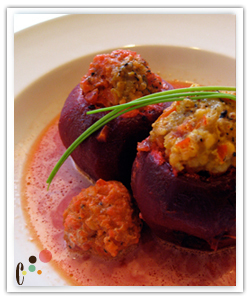 Plate the stuffed beets and meat balls in a shallow bowl and gently pour some of the soup around it. Drop a small amount of heavy cream in the soup. Sprinkle the chives on top of the beets as a garnish.